New data released today measure changes in land subsidence in the Sacramento Valley over the past nine years, finding the greatest land surface declines near the city of Arbuckle in Colusa County. According to the Sacramento Valley GPS Subsidence Network Report and accompanying fact sheet, most of the valley has experienced little to no subsidence, however, land in the Arbuckle area has sunk 2.14 feet compared with baseline measurements recorded in the same location in 2008. The report was led by the California Department of Water Resources (DWR), in coordination with 19 state and local agencies. Land subsidence can damage critical infrastructure, including water delivery systems, levees, roads, and bridges. In 2017, DWR worked with NASA to release a report on San Joaquin Valley subsidence citing areas along the California Aqueduct that have experienced almost two feet of subsidence over three years. The Sacramento Valley survey results were collected as groundwater levels were recovering from the severe drought of 2012-16, which saw groundwater levels in much of the state reach historic lows. Compared with 2011 pre-drought groundwater levels, the largest decreases were observed in Glenn and Colusa counties at 58 to 43 feet, respectively. Field work indicates that groundwater levels have recovered an average of seven feet, but more frequent and more comprehensive monitoring is needed to more accurately detail the impacts of droughts and high-water years on groundwater levels and subsidence. 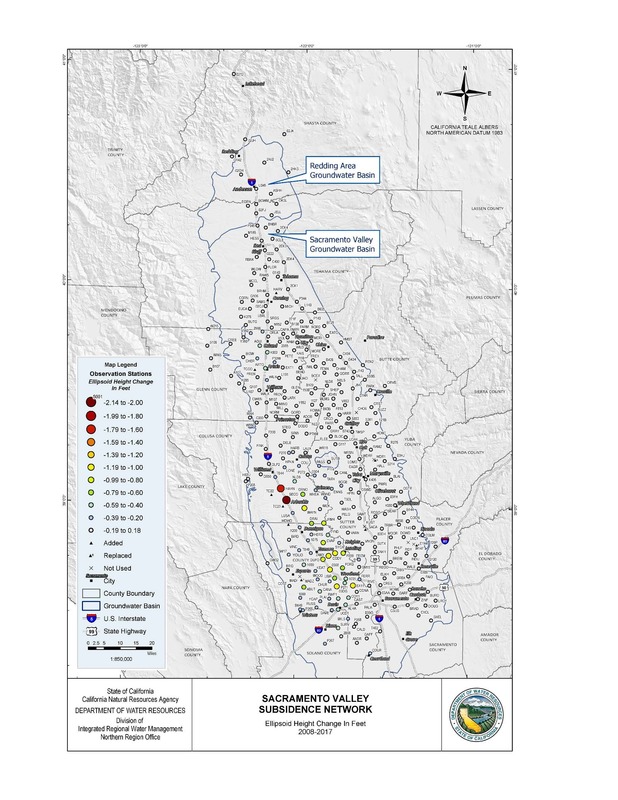 The Sacramento Valley GPS Subsidence Monitoring Network, launched by DWR in 2008, surveyed 300 measurement locations in 11 counties from Shasta County in the north to Solano and Sacramento counties in the south. The 2017 resurvey effort was led by DWR’s Division of Integrated Regional Water Management (DIRWM) Northern Region Office (NRO), with the assistance of 19 state, county, and local entities. “The data provided in this report are an example of the technical assistance we provide and the collaborative effort needed to facilitate successful and sustainable groundwater plans at the local level,” said Taryn Ravazzini, DWR Deputy Director of Special Initiatives. Land Use Viewer: Allows local agencies and the public to access land use survey datasets for the past 30 years. Well Completion Report Viewer: Provides information about wells collected during the drilling and construction of water wells. SGMA Data Viewer: Compiles many groundwater related datasets that can be used to look at groundwater levels and subsidence. The Sacramento Valley subsidence report also concludes that areas of Yolo County experienced the most widespread subsidence, in terms of geographic area affected by subsidence, with 31 survey sites measuring a land surface decline between .3 and 1.1 feet. Other statistically significant levels of subsidence were observed at three survey sites in Glenn County (between .44 and .59 feet of subsidence) and five survey sites in Sutter County (between .20 and .36 feet of subsidence).